Before a user can be added in a SharePoint site, he/she must first exist in a directory service (i.e. Active Directory, Local server user). If not, that user cannot be given access to a SharePoint site. Click “Add User”. This will navigate you to the following page. All users entered must be validated against the directory service (i.e. 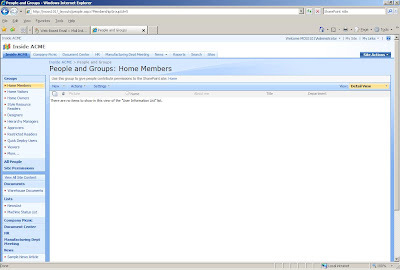 Active Directory, Local Server), as indicated by the “Check Names” and “Browse” icons located below the “Users/Groups” entry box. At this point, you can either enter a known user name and validate them by clicking the “Check Names” icon, or clicking the “Browse” icon to search for the desired user. Clicking the “Browse” icon will produce the following pop-up window. After the correct user is selected, select the desired persmissions and click “OK”. The new user can now login into the SharePoint site. Microsoft is offering a free Second Shot on certification exams through Prometric. To register for a free second shot, go to http://www.microsoft.com/learning/mcp/offers/secondshot/default.mspx. After registering, you will receive an e-mail with a link providing a voucher #. Please note this link will produce a unique voucher # every time it's clicked. This offer is valid through January 30, 2008. I normally wouldn't blog anything about T-Shirts, but this is just over the top that it leaves me speechless. Thanks to the ingenious ThinkGeek robot monkeys you can display the current wi-fi signal strength to yourself and everyone around you with this stylish Wi-Fi Detector Shirt. The glowing bars on the front of the shirt dynamically change as the surrounding Wi-Fi signal strength fluctuates. For more info or to order, go to http://www.thinkgeek.com/tshirts/generic/991e/?cpg=cj. Listed below are a few articles that I thought were very interesting, courtesy of CodeProject. Yesterday, I made a blog entry on Microsoft's recent release of Search Server 2008. To go along with that release, an SDK is also available. The Microsoft Search Server 2008 Software Development Kit (SDK) includes documentation for Microsoft Search Server 2008. Its object models are based on the Enterprise Search object model in Office SharePoint Server 2007 with some additional members in the search-related namespaces for federated search. Microsoft recently released an updated version of it's presence controls. It includes two managed code user controls to display presence status and provide real-time collaboration options in .NET applications. One control presents an interactive presence icon next to a control on a form that contains a name. The second control is derived from a ListView control to display the presence status icon next to names in a list. Both controls provide tooltips, a context menu, and events for contact status changes. Listed below is a summary of the .Net events scheduled for this month. Attend a few and increase your .Net knowledge!